Miss Sarah Renee Harmdierks was born on July 11th to our good friends, Melissa and Drew. 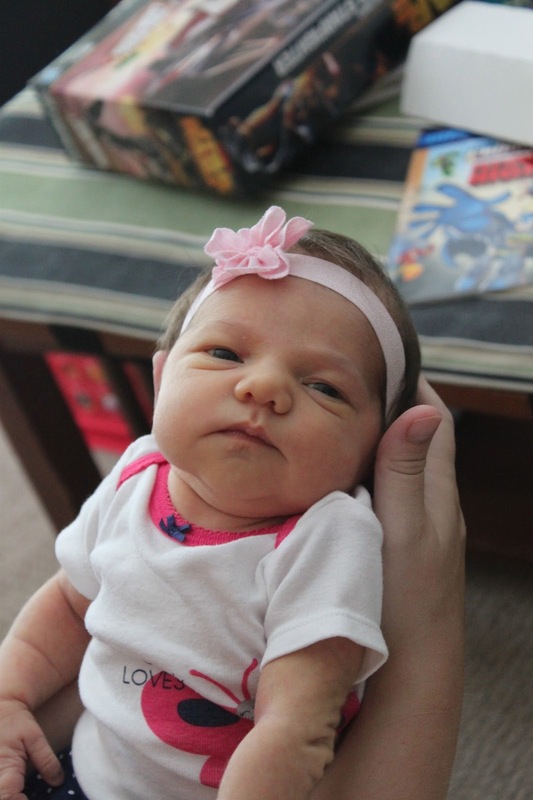 It was really wild to have a little tiny infant in my house - and my arms - again. She is beautiful. Brian was a little nervous and asked me later, "Mama? Why was baby Sarah crying? Maybe she wanted one of my toys." All I could think was... get used to that! Both the crying - and a little sister wanting to play with your toys! Saturday evening the three of us (I hate writing that) went to my brother and sister-in-law's house for a birthday party! My twin nephews, Tommy and Aidan turned nine - and they share their birthday with their Dad! Being in their house was a little tough for me. Last time I was at Gavin's Godfather's house was Christmas. Brian was sick so I went with Gavin and it was such a special night for us. ...so it did make me smile to see Brian and Bella having a great time yesterday. I'm sure Gavin was there laughing right along with them as they mischievously ran through the automatic lawn sprinklers in their clothes!! Lucky for me, Brian has older cousins that gave him a new outfit for the rest of the night. Brian had such a great time - and we didn't get him to bed until ten o'clock which is SO late for him! I'm not sure who was more exhausted, to be honest - him or me. Crying at night makes for tough days sometimes. And that's what I've been doing all weekend. I am just really missing my little boy so much. Which is why I was so grateful for the fun distractions this weekend. 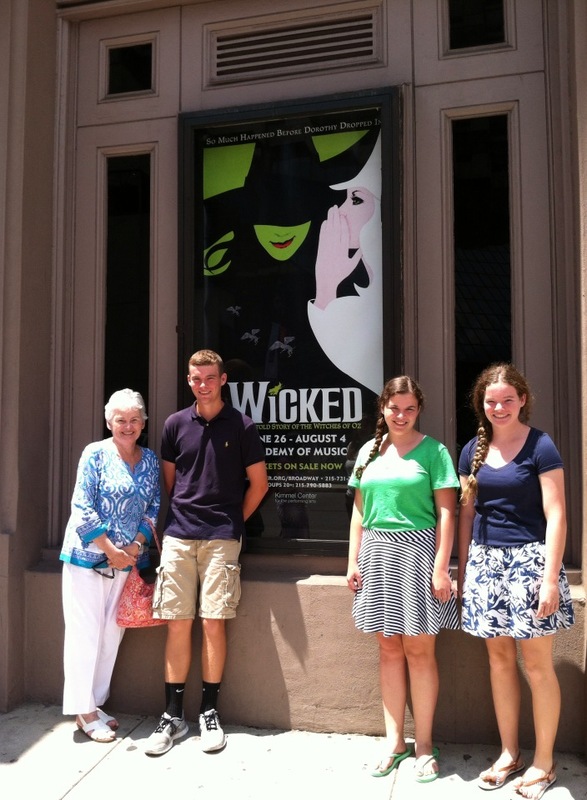 Granny treated me and the triplets - Shannon, Brendan and Claire - to a show in Philadelphia! We took the train into the city and went to see Wicked - one of my favorite musicals! After I dropped everyone off, I stalled coming home tonight. I couldn't hold it together and was hoping I could arrive home after Brian was safely tucked in bed. I ended up driving to the Kindergarten Center. Gavin was set to begin Kindergarten there on August 26th. I should be shopping for new clothes for my big Kindergartener and maybe even a new lunchbox. Instead I am shopping for brand new baby things all over again. My life feels upside down, joyful and at times, very confusing. I sat in my car and cried and cried. It is truly amazing how your life can turn on a dime. I'm doing my best to balance myself on that dime - and sometimes I get it, sometimes I don't. But it's all part of the process, I guess. I just take every day - every emotion - every up and every down as it comes. And sometimes I look for, long for and am grateful for those distractions. Like coming home to a wide awake Brian who wanted me to tuck him in. Despite it all, I remain one very lucky and grateful Mommy. hugs to you. Our lives are very complicated here. But you highlight the joy in every day. Thank you. I'm so glad he waited up for you. I'm not sure why, but that's the best part for me. perfect song. left me with tears in my eyes. hugs and prayers to you kate. hugs and prayers and lots of love. What a cute baby. It's okay to cry sometimes and sometimes it's even okay to cry in front of Brian by doing that you're showing him it's okay to be sad. Oh, I know better than to watch that video here at my work desk - it gets me every single time! I lost my Mom in May and the loss I feel took me by surprise. And I can't even compare that to the loss of a child. I'm so very sorry and my heart hurts for you. I try very hard to make sense of this world, but sometimes it just doesn't seem fair!! Then, I think about Hope and it seems to balance out my feelings a bit. Praying for you...and Brian...and Hope...and Ed...and Gavin. How can we feel so destroyed and so very blessed at the same time? Love and hugs from Arkansas!